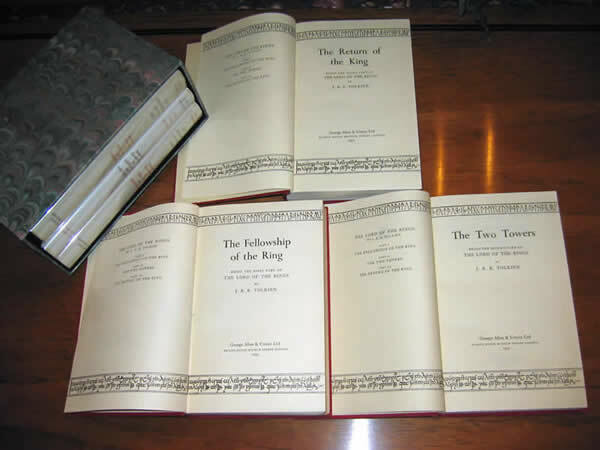 The Fellowship of the Ring is a 2nd impression published in 1954. 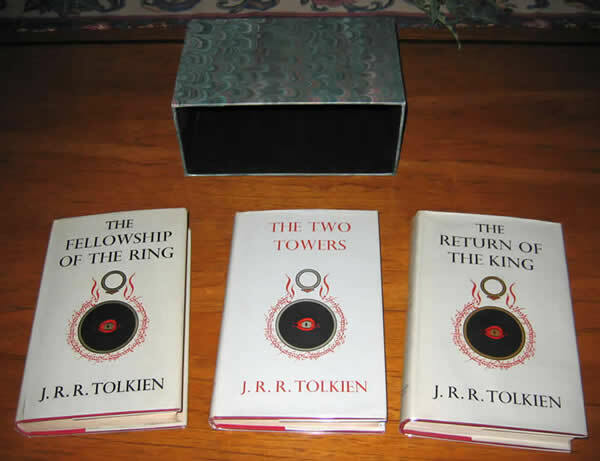 The Two Towers is a 2nd impression published 1955, with the date on the title page, indicating a true 2nd impression, not the 3rd imp. that misidentifies itself as a 2nd, but does not have the 1955 on the title page. 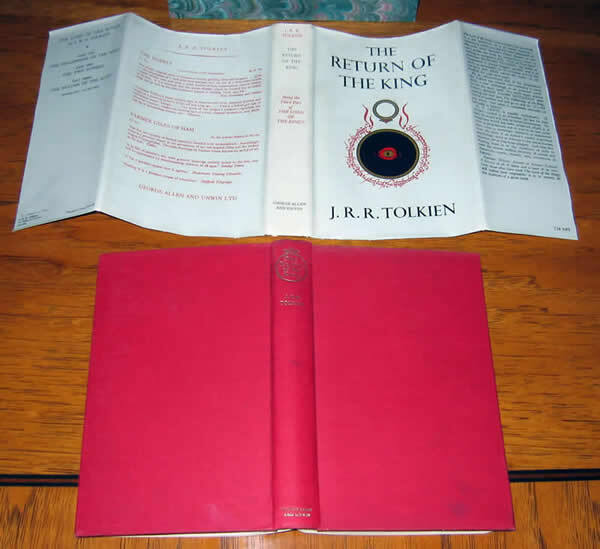 The Return of the King is a 1st impression published 1955, 1st State with the signature mark '4' and the infamous slipped type on page 49, as per Hammond and Anderson. 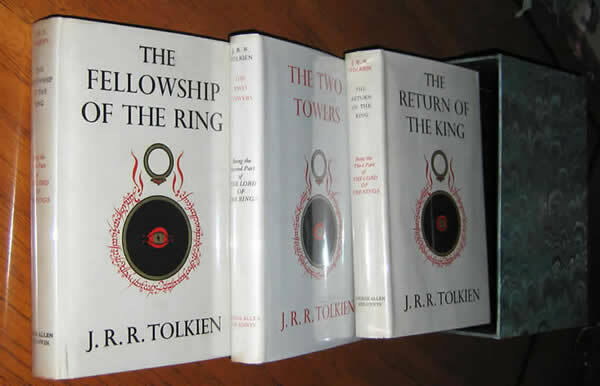 The Fellowship of the Ring is a 2nd impression published in 1954. 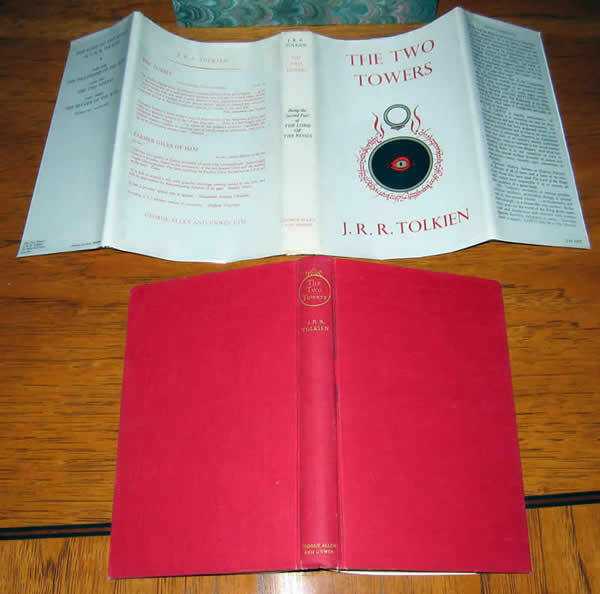 The Two Towers is a 2nd impression published 1955, with the date on the title page, indicating a true 2nd impression, not the 3rd imp. that misidentifies itself as a 2nd, but does not have the 1955 on the title page. 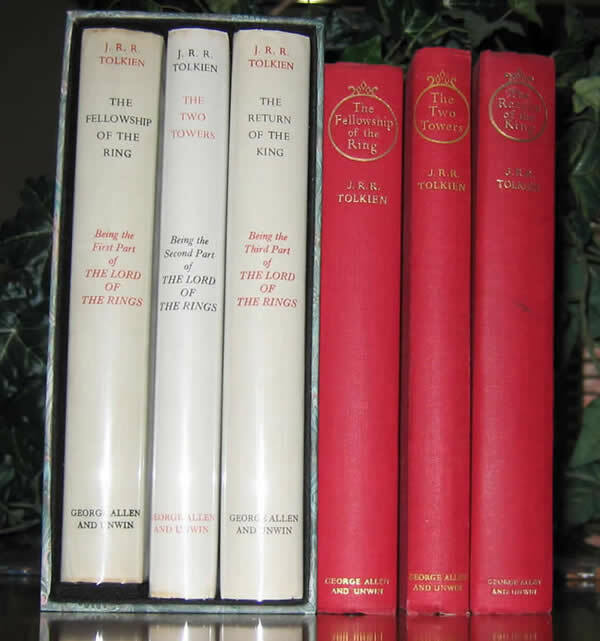 The Return of the King is a 1st impression published 1955, 1st State with the signature mark '4' and the infamous slipped type on page 49, as per Hammond and Anderson. All original maps are present and in Near Fine condition. 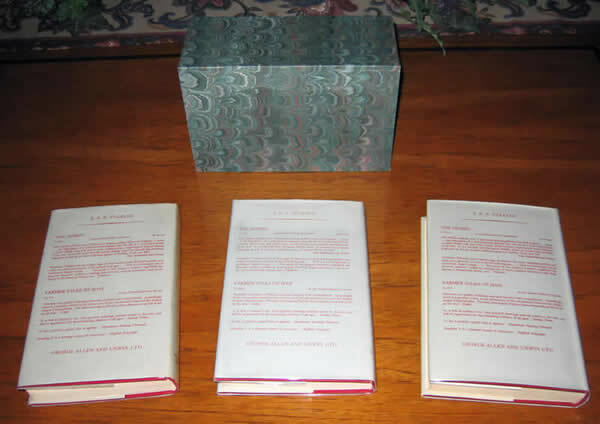 All three books are in their original dustjackets in Near Fine Condition. None are price clipped, and they have virtually no wear to the tips of the spine or folds, or edges. The text block is clean, bright and tight, with only light foxing on the FFEP of the Return of the King. The others lack any internal foxing or markings. A beautiful, collectable set of first editions of this classic of fantasy literature. 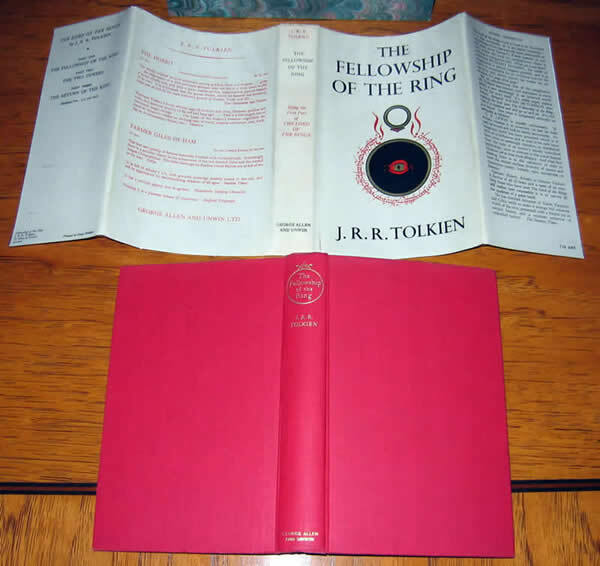 The Fellowship of the Ring is a 1st UK Edition, 2nd impression with the book in Near Fine condition, lacking any markings or names, with no foxing or offsetting on the free endpapers. The gilt is bright and untarnished on the spine. The boards are very clean and bright, with virtually no shelf wear on the bottom edge, one lightly bumped corner on the front board. The topstain is faded and slightly dusty. The dustjacket is unclipped and shows beautifully, with one small mark at the bottom of the front gutter. Virtually no wear to the edges or folds. No tanning of the spine or soiling. A beautiful, correct 2nd impression dustjacket, with no fading to the red lettering on the spine. 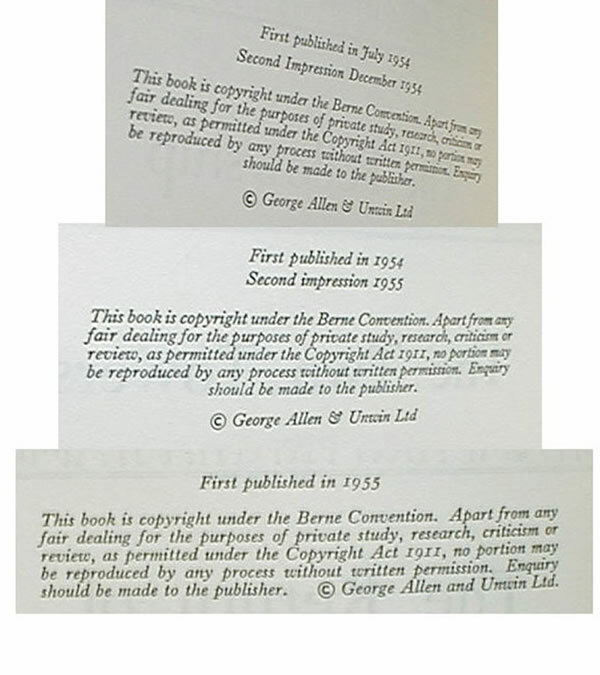 The Two Tower's - 1st UK Edition, 2nd impression, has the date (1955) on the title page, which would indicate a true 2nd imp. Book is in Near Fine condition. No markings or names. No offseting or foxing on the endpapers. The text block is clean and bright, without markings or soiling, so tight I doubt if ever read. The boards are very clean and bright, without any bumps, but a very little shelf wear to a couple of corners, no noticeable wear to the spine tips. Topstain is faded. Gilt is bright and untarnished, somewhat dimmed compared to the other two, which look new. 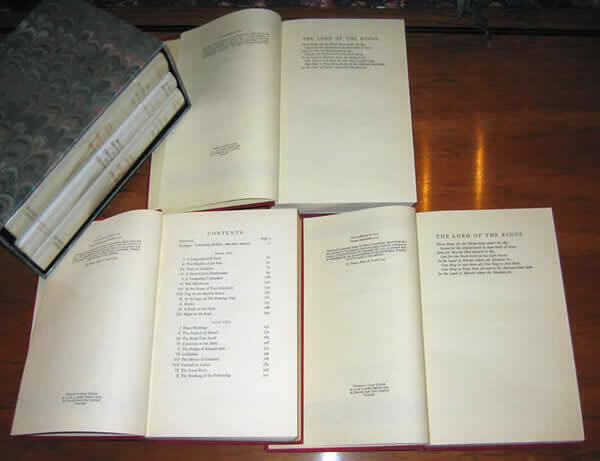 The dustjacket is not clipped, and has no tanning to the spine, no soiling, and no fading to the red lettering on the spine. 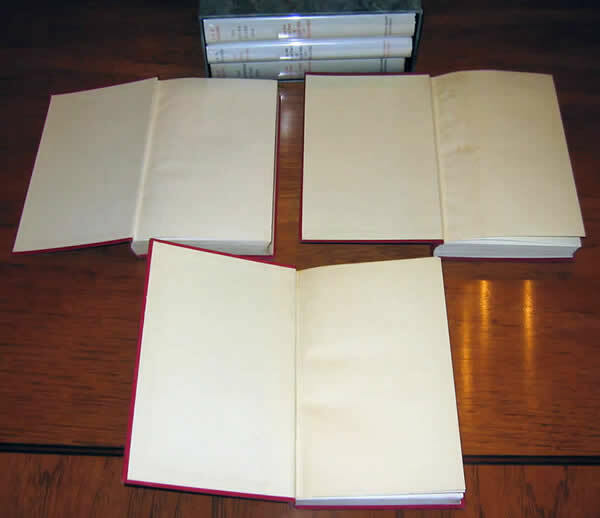 Only the most minor chips or wrinkles to the edges, mostly at the top front fold of the spine. A lovely copy, in its correct and original 2nd impression dustjacket, no repairs or restoration whatsoever. 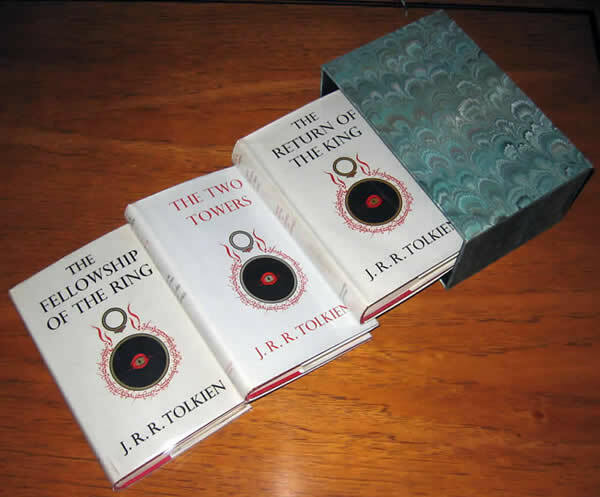 A fantastic set of First Editions of this classic of fantasy literature, with a custom slipcase to protect and house these 'precious' books.